Whether from disease, malnutrition or genetic disorders, sometimes it is necessary for us to extract all of a patient's lower or upper teeth. While this can be devastating, dentures can provide a second chance at a beautiful smile. Having complete dentures help with chewing as well as support one's facial structure and improve speech. 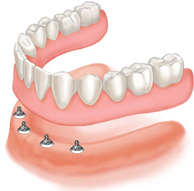 With immediate dentures, you can have a full set of teeth while you are waiting for your gums to heal and your bone to realign after having teeth removed. This can take up to six months, so immediate dentures are a great alternative during that time.